Infrared laser skin tightening is a minimally invasive way to tighten skin without surgery to help reverse some of the signs of ageing. Devices which do this include Titan. It uses a broadband spectrum of infra red light which heats up the water content in the skin, causing the surrounding collagen to contract and tighten, and the body’s own natural healing process then starts producing new collagen to further tighten the overall appearance of the skin over several months. It is not designed to treat large areas of loose or redundant skin, such as after massive weight-loss, which may be better suited to surgical approaches; but is suitable for treating small areas of lax and redundant skin on the abdomen (e.g. post pregnancy tummy), thighs and underarms and to tone, lift and tighten skin on the face and neck. Results do vary significantly between individuals. Depending on the device used, prices can range from approximately £200 - £750 per session for areas such as the whole face or abdomen (tummy). The Titan™ procedure is a non-surgical process that uses an infrared light source to tighten skin and reverse the signs of ageing. 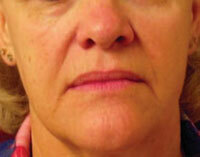 The science of non-surgical skin tightening is a fast growing area of aesthetic medicine. With more and more of us demanding minimally invasive ways of improving skin laxity, without succumbing to the knife and a surgical face lift, more and more devices and modalities are being discovered which can meet this need. Practitioners are now able to use technologies such as radiofrequency and various types of lasers, or a combination of the two modalities for skin tightening treatments; and now infra red light is also being used. All of these technologies are being harnessed in a variety of devices which can then deliver the energy to a targeted area of the skin, causing heating of the underlying tissues. This heat causes the collagen within the skin to be damaged, in a controlled way, that makes it tighten almost immediately, and also starts off the body’s own healing process to produce fresh, new collagen which continues the tightening process over a period of months; aiming to produce a more youthful appearance to the skin in the treated area. If you are considering treatment with infra red laser skin tightening, the following information will give you a basic understanding of the procedure. It can't answer all your questions, since a lot depends on the individual patient. Please ask a practitioner about anything you don't understand. What is Infra Red Laser Skin Tightening and how does it work? Infrared Laser Skin Tightening, currently available in the UK using devices such as the Titan™ , is a minimally invasive way to tighten skin and reverse the signs of ageing. The treatment is aimed as a safe, non-surgical procedure for tightening the skin and stimulating long-term collagen rebuilding, leading to younger looking skin. The procedure uses a broadband spectrum of infrared light which heats up the water content in the skin, causing the surrounding collagen to contract and tighten, and for the body’s own natural healing process to start producing new collagen to further tighten the overall appearance of the skin over several months. What happens during an Infra Red Laser Skin Tightening treatment? Your doctor will give you specific instructions before coming in for the procedure. This may include avoiding the use of aspirin or any other non-steroidal anti-inflammatory (NSAIDS) drugs for a couple of weeks before treatment. They may advise you to stop smoking as this can delay wound healing, and avoid alcohol for a few days before the procedure. The length of the treatment session depends on the size of the area(s) being treated, but can take between ½ and 1 hour. Expect 1 hour or longer for treating an area such as the tummy or full face and neck. Although some people notice an immediate change following treatments, the results are seen gradually over a period of 1 – 3 months as new collagen is formed and the skin tightens further. The manufacturers of the Titan™ device claim that clinical studies have shown the improvements last 1 – 2 years. A single treatment session has produced very good results for some people. 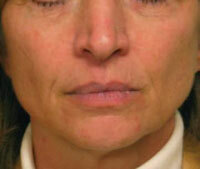 However, most people need two treatments, spaced 1 month apart. 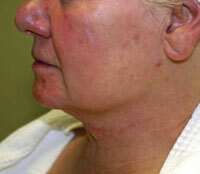 Severe skin laxity may require 3 treatments. Your practitioner will advise you as to the number and frequency of treatments recommended for optimal results. Further maintenance treatments over the years (every 1½ - 2 years) can be given when needed. How long will it take to recover from Infra Red Laser Skin Tightening? What are the risks and potential complications from Infra Red Laser Skin Tightening treatment? Treatment is generally considered by most people to be ‘near’ painless, with no pain or discomfort post-treatment being reported. A warm sensation or feeling of heat has been reported during treatment. Some people, depending on pain thresholds, may find this uncomfortable. There are very few documented side effects to date, although mild swelling and redness post-treatment is to be expected. This may last 24 hours but will normally resolve after 1 - 2 hours. In very rare cases, small blisters (or burns) may occur on the skin, which should heal in under a week. This is generally considered to be a risk (albeit an extremely rare one) in more boney areas of the body, such as on the forehead or along the jawbone. What should you do after an Infra Red Laser Skin Tightening treatment? Due to the nature of this type of treatment there are no specific requirements post-treatment, and all normal activities can be resumed immediately. However, it is very important that you follow the advice of your practitioner carefully after any infra red laser skin tightening treatment to help to ensure the success of the procedure and reduce the risk of complications. Contact your practitioner immediately if you experience a sudden increase in pain in the treated area, or notice any blistering of the skin. 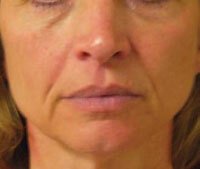 Who should not have Infra Red Laser Skin Tightening treatment? 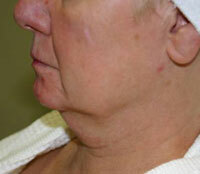 Large areas of loose or redundant skin, such as after massive weight-loss may be better suited to surgical approaches. Also, until further studies have been carried out it is advisable not to have treatment directly over dermal filler products. 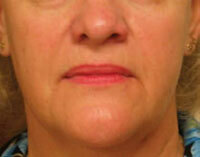 Who can perform Infra Red Laser Skin Tightening? Only suitably trained medical professionals and therapists should perform infrared laser skin tightening procedures. What is the average cost of Infra Red Laser Skin Tightening? Private costs for Infrared Laser Skin Tightening depend on the area(s) being treated. Prices with the Titan™ device for example can start from approximately £750 per session for areas such as the whole face or abdomen (tummy). Larger areas such as the face and neck combined start from approximately £900. Smaller areas such as the neck or part of the face (upper or lower) range from £300 - £500 per session. Prices can be lower for other devices using this technology. 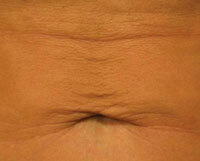 Infrared laser skin tightening is the latest, minimally invasive way to tighten skin and reverse the signs of ageing. It uses a broadband spectrum of infra red light which heats up the water content in the skin, causing the surrounding collagen to contract and tighten, and the body’s own natural healing process then starts producing new collagen to further tighten the overall appearance of the skin over several months. It is not designed to treat large areas of loose or redundant skin, such as after massive weight-loss, which may be better suited to surgical approaches; but is suitable for treating small areas of lax and redundant skin on the abdomen (e.g. post pregnancy tummy), thighs and underarms and to tone, lift and tighten skin on the face and neck. Results do vary significantly between individuals from very minor tightening to, occasionally, pronounced tightening of the area treated. Before and After images using the Titan™ device. Before treatment and immediately post single treatment. Before treatment and 2 months after two treatments. Images provided courtesy of General Practice Lasers Ltd.
Click for ALL Infra Red Laser Skin Tightening clinics in the UK & Ireland registered and verified by Consulting Room.